On 15th July 2016 an unsuccessful attempt at a coup happened in Turkey. Even at this early stage, the post-coup process obviously will have important consequences. It is important to understand that this process was started on the 7th June 2015, when Erdogan lost the elections and conducted an anti-democratic intervention into the results. It is important to make a comprehensive analysis of the coup in order to understand the potential outcomes. Before everything, it is important to specify that this coup was not undertaken by Gulenists. Due to the conflict between the AKP and the Gulenists, sympathisers of Gulen may have taken part in the coup attempt. But by saying “the Gulenists attempted the coup” they are trying to make a platform in which they can suppress Gulen’s supporters even more. By labelling the coup as Gulenist, they are hoping to rally support in order to take revenge on the coup plotters. In other words, they are trying to kill two birds with one stone. It is evident that this attempt was backed by a large part of the army. If they had planned and executed it more professionally, it may have had a chance to succeed. In this regard, it cannot be said that it was undertaken by Gulenists or a minority; there isn’t enough of a Gulenist presence in the army to pull off a coup. Maybe many of the coup plotters who are waging the war against the Kurds in Kurdistan were not practically involved, but it has been understood that many of the Generals in the region supported the coup. They were careful because their participation would have hampered their war effort against the Kurds. However, many of the Generals in the war against the Kurds have been detained as supporters of the coup. When the AKP couldn’t solve the Kurdish question, it veered towards a war of destruction against the Kurdish Freedom Movement in the past year. Especially towards the end of 2014 and the 7th June 2015 election, the coup mechanism was in place and resulted in the attempt at a fascist coalition. When Erdogan veered off towards war, the army became the main player. Tayyip Erdogan and the AKP were dependent on the army in their war against the Kurdish Freedom Movement. 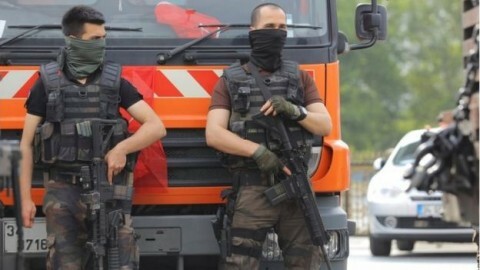 When Erdogan decided to intensify the war and sent the army to destroy Kurdish towns, the coup mechanism was set in place. During the war, the army strengthened its own hand against Erdogan. This is because the army can only become a central player in Turkish politics while it is in a war against the Kurdish Freedom Movement. So after a period in which the army had lost its centrality in Turkish politics, through Erdogan’s notion that “we won the war in the cities, we destroyed the PKK”, the army once again gained the confidence to attempt a coup. This coup wanted to redesign Turkish politics. The statement by the coup-plotters clearly points towards this. The coup-plotters are a new nationalist wing, separate from the Ergenekonists [traditional nationalist statists]. This new trend has been shaped by an opposition to the policies of the AKP. We might even say that the changes made in the AKP’s foreign policy (renewing relations with Israel and Russia, and a change of policy towards Egypt, Iraq and Syria) may have stimulated this new formation. This coup-plotters, who can also be called ‘neo-nationalists’, have closely witnessed the cooperative relationship between the AKP and ISIS. Due to the fact that they are on the frontlines where this relationship is being implemented, they have learnt how the relationship between the AKP and ISIS is handled. If the coup had been successful, they would have prosecuted the AKP for supporting ISIS with backing from the West. It seems as though the coup-plotters’ approach was: “Turkey’s main political problem is the Kurdish question, and we are the ones on the front line, so we should shape the politics of Turkey.” When civilian governments do not have any policies in solving the Kurdish question, the coup mechanism is always functioning. The fact that they named themselves “The Council of Peace in the Country” is a reflection of their thinking that “we will conduct the politics when it comes to the Kurdish question”. In short, their approach was “whoever is fighting the PKK should dominate politics and own Turkey”. After the coup was defeated, the AKP and its allies declared themselves as the “will of the people” and “democratic forces”. The AKP now hopes to strengthen its grasp on power and their anti-Kurdish, anti-democratic system. In this regard the representation of the AKP, its supporters and its allies as the defenders of democracy is a dangerous development; the AKP can more easily implement its anti-Kurdish, anti-democratic policies. Given that the AKP’s allies are the Nationalist Movement Party (MHP) and chauvinist nationalists, a rise in anti-Kurdish sentiment and anti-democratic approaches can be expected. These forces have become even more tight-knit after the coup attempt; this will lead to a deepening of genocidal policies against the Kurds. Just as this coup attempt has emboldened the AKP, its allies and the nationalists, it has also radicalised the sectarian nationalist circles close to the AKP. This will lead to a new breed of Turkish ISIS-like formations, such as Osmanli Ocaklari, a paramilitary group organised by Erdogan himself. They are already organising in European countries; links between them and ISIS are already being discussed. These sectarian nationalist trends will further radicalise and become repressive forces against any opposition to the AKP. Many of the people who took to the streets during this period were from these organisations. It can be expected that these groups will step up their attacks against the Kurdish people. The freedom forces of the Kurdish people and the democratic forces of the country should prepare themselves against these attacks. There are statements that say “this coup attempt should be turned into an opportunity and platform for democratization”. These calls are made with good intentions but need to be followed up. All attempts at a coup can be blocked by democratisation. However, the anti-coup rhetoric of some is not grounded in a democratic mentality; rather it is more to do with the ongoing power struggle. These people aren’t democrats or anti-coup! These people had already taken power through a coup against democracy. For this reason, democratisation cannot be expected of these people in order to hinder possible coup attempts. These people will use this coup attempt in order cover their real faces and intentions. They have already started doing this. In this regard, to expect that the AKP will take steps to democratise the country in response to this coup attempt is nothing but self-deception. One needs to take a closer look at Erdogan and the alliances of his Gladio. Nothing other than anti-Kurdish sentiment and anti-democratic development can be expected from this coalition. And when the AKP eventually discards these allied groups, the sectarian nationalist groups will radicalise and become Turkey’s version of ISIS. Under the ideological and political umbrella of the AKP, a more radical version of the Muslim Brotherhood will be formed in the region. Tayyip Erdogan will see this coup attempt as an opportunity to make preparations and take steps towards this end. There already are sectarian nationalist factions within the police force. Erdogan saw the actions of these groups during this coup attempt. Turkey will become a police state. The police will become an alternative armed force to the army. The forces of democracy must re-analyse the situation after this coup attempt. The fascism of the AKP will seek to suppress all democratic forces. They will try to get all factions of society to obey its rule. Any opposition will be labelled as ‘coup-supporters’ and will be brutally suppressed. If the forces of democracy do not act to change this situation, Erdogan will force everyone into submission. In this regard, the forces of democracy must understand the reality of the AKP and its allies and must form a new front for resistance.